Muzzleloader deer hunting with Mid-America Hunting Association covers Mule and Whitetail Deer, pre rut, trail and post rut hunts. Starting early in Kansas then again during regular firearms. Later in Missouri and even later yet in Iowa. Inline, solid propellant and scopes are legal in all three states. Within the Association muzzleloader hunters are a minority group. Each having more places to hunt than time. The interest for muzzleloader is along lines of Kansas’ early and Iowa’s late seasons. These seasons are unique to may hunters as they are outside reproduction motivated behavior. Rather these periods require deer hunting tactics suited for deer patterns based on food and survival. Kansas muzzleloader deer season is before the rut. On bachelor group bucks. That same tag allows a muzzleloader hunter to return during the regular firearms deer season for a second hunt. 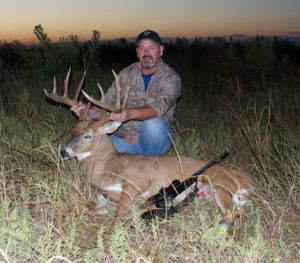 The earlier Kansas muzzleloader deer season is also unique hunting experience as tree stands are a secondary method of pursuing these bucks. These deer at this time of the year hardly move more than required. Usually not more than 5 to 10 acres. A black powder hunter is well advised to put on leather boots to first scout out these grouped bucks. Then once found, use binoculars to pattern their highly routine daylight movement patterns before any hunt. Once patterned it is simply a matter of interdicting their daily movement without impacting on their core bedding area. That is when a tree stand comes into play. While this seems easy to read then apply this Kansas muzzleloader deer season is not an easy hunt. The difficulty is foliage which will force tree stands lower than wanted and may make 10 yard shots on standing deer sometimes an impossibility. My brother [above] and I had some success with the muzzle loaders this year. We had some difficulty because the deer pattern switched from soy beans to acorns right before the season opened. With a few adjustments, we were able to get onto a couple of nice ones. A challenge to Kansas' early muzzleloader season is cover. Tall standing corn, green leaf trees. Plenty of concealment. This is prime whitetail habitat along a wooded creek bottom. The Kansas muzzleloader season is well before any fall frost initiating leaf color change and drop. All edge lines will be as heavy into leaves as they will ever be. Tall prairie grass will be high. While all hope for a good clear profile shot the reality will be bits and parts of deer bodies through tree and brush keyholes. Combined with warm weather will cause most who try this early hunt to return to better understood peak rut hunts from winter tree stands with clear fields of fire out to several hundred yards. A comment about preferred foods by season may be different than what most folks expect to find when traveling from out of state. 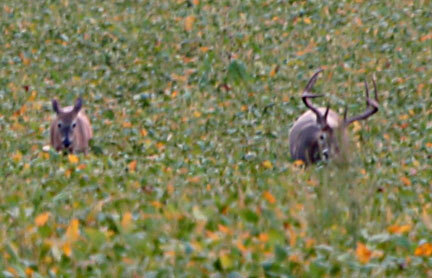 This (right) is an early October picture of deer feeding on what is locally called beans or Soybeans. The amount of yellow leaf is an indicator of a narrow time frame of the picture. The beans have lost their deep green leaf color overall turning a lighter green. Concurrently, yellow leaf reaching its end of maturity becomes more pronounced as fall progresses right into harvest. Bur Oak in July at about mid-maturity. The Bur Oak is distinctive due to its hull with soft spines. The hull remains attached on the dropped acorns. Around the middle of September each year our locally predominate Oak Tree, Bur Oaks, drops their acorns. Bur Oak acorn is as attractive to deer as many recognize White Oak acorn to be. A food source attraction lasts for a week to ten days. By the last weekend of September first of the rubs begin to show and the rut is on. Once behavior is reproductive motivated acorns like any one food source no longer is an influencing factor in trophy deer hunting. One aspect of our oak and for most part all nut producing trees is they are more likely to be found in a linear distribution along creek bottoms rather than what some have experienced with White Oak patches/groves. This is topography and agriculturally driven as farming practices leaves only slopes of creeks for tree growth. Missouri muzzleloader deer season is after their modern firearms season and overlaps with archery season. Unique to this state, the whitetail deer hunter can have both an archery tag and a firearms tag good that also covers Missouri’s muzzleloader season. For those with a husband and wife hunting team where the husband prefers archery and the wife muzzleloader these two overlapping seasons allow for such a combined deer hunt. It ensures one more option for a spousal team to spend time together in the field. Missouri black powder season is in the trail of the rut with scrapes active but on the down side. Any doe with a buck trailing will most likely be a yearling late to come into season. The whitetail’s as a whole will begin to herd up and occupy sheltered habitat especially during the colder winters. A disadvantage to this behavior is an unwary hunter who enters a wooded creek bottom patch may suddenly find 15 sets of eyeballs on him with no hope of maneuvering in close for a shot. This transitional behavior period from reduced rut to winter survival patterns makes for a more unstable movement pattern highly affected by weather. An observant deer hunter tuned into these variables should do well. However, we find some hunters stuck in their own habit without any flexibility to adjust to changing deer patterns. 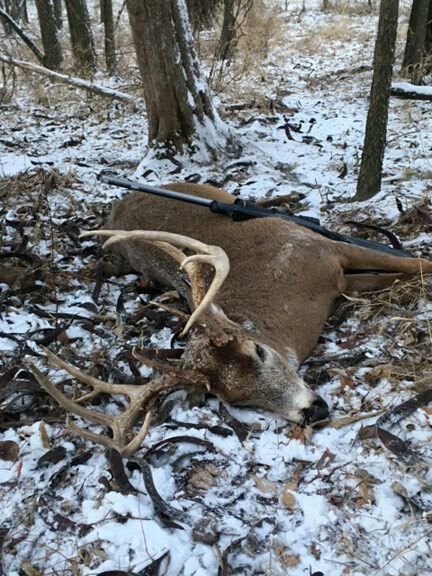 Iowa rounds out muzzleloader deer hunts late in the year. 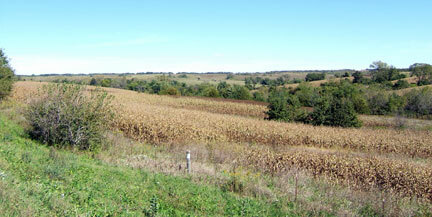 A similar option compared to Kansas where hunters are pursuing whitetail’s outside of any rut activity. When bucks have returned to more predictable movement patterns. This is another case where a beginning of any deer hunt is scouting with firearm seeking out loafing and bedding areas. Food is often plentiful in waste grain. A time of year when the initial part of a hunt is on foot followed by tree stand interdiction of movement patterns. Food will be a prime director of behavior due to this northern of our three states earlier and colder winter with much more snowfall. For the greatest predicable whitetail behavior a colder winter with snow cover means a greater dependence on foraging the many large grain crop fields. That combined with good shelter habitat gives a hunter a better view of where to seek out his buck. Muzzleloader deer hunts across these three states gives a great range of whitetail pattern that any one deer hunter may find more able to capitalize on than others. That range of options characterizes MAHA’s approach for do it yourself hunters with a central focus to deer hunt where/when/what he hunts best. And, by the firearm he hunts best, be it muzzleloader deer hunting, archery or modern firearms. A common mistake for many muzzleloader hunters is to attempt to hunt two or more of these seasons. Reality for all of us is any one of us only has so much energy and time. From these three states with four muzzleloader season dates settling in on the one where the hunter is most likely to put forth his greatest endeavor often gains success over the idea more time in field gets better results. Or, the folks who send in the most pictures typically hunt but one state. 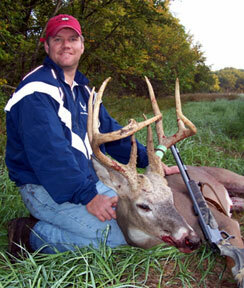 Muzzleloader deer hunting offers sequential Kansas, Missouri and Iowa deer seasons. Allowing for 6 weeks of deer hunting without impact on other deer seasons. During a low pressure time of year. Kansas muzzleloader season offers variety in two regards. First, is early muzzleloader season. A warm weather, pre rut season where stalking is effective. Far different than during rut hunting from early October through mid December where tree stands are more effective. 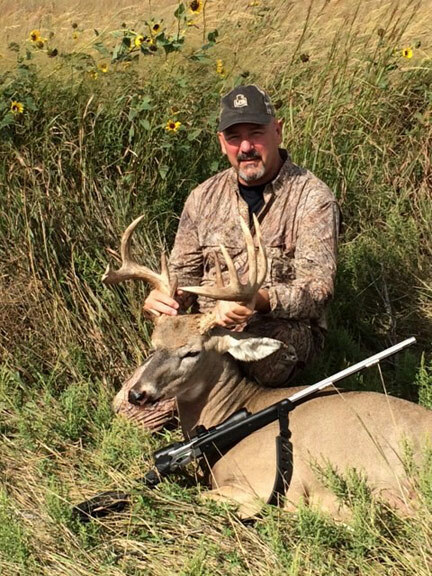 Second, Kansas modern gun deer season allows a muzzleloader deer hunter to hunt once more on the same tag. This provides in general 20+ days of firearms deer season making vacation scheduling easier. The real advantage to Kansas’ early muzzleloader deer season is opportunity to hunt bachelor group bucks. They are lazy, do not move much and are easily pre-season scouted. Altogether more skill rather than need for much luck as during peak rut when the bucks are on hot doe. For those who truly want to expand their whitetail adventure, these bachelor group bucks are a different kind of a hunt. One most hunters have not experienced. Further, Kansas deer seasons are offset from Missouri’s modern gun and muzzleloader seasons. Missouri tags are over the counter purchase. Combining Kansas and Missouri then separate modern and muzzleloader seasons gives up to 8 weeks of season to schedule as many hunts as vacation time will allow. All of this is for the same cost. However, no one has the energy or time to hunt all these available days. It all comes down to this is an example how MAHA allows great flexibility for the limited free time we all have. 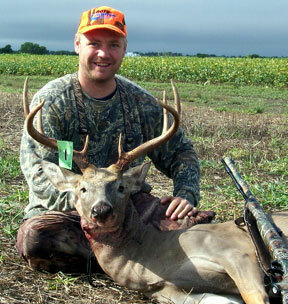 Iowa muzzleloader deer season offers yet another opportunity to hunt bucks outside of rut. This is a post rut season. Starting late in December for non-residents. We assume at this point that Iowa residents know about Iowa’s split seasons for resident and non-resident deer hunters. This late post rut Iowa deer season further allows for advantages as Kansas’ early muzzleloader season. A hunter may apply more skill at stalking. A predictable deer pattern rather than requiring as much luck as skill as during rut when buck movements are dictated by a doe in season. Between these two muzzleloader deer seasons in Iowa and Kansas hunters has basically 4 weeks of whitetail deer hunting field time. All on survival based movement patterns. Reality is more hunting opportunity than 99% of hunters have free time to use. Our pricing is based on average usage, not maximum potential season days. Further, greatest success does come from hunting less. Those who try to hunt more than one state or season have lower taxidermy bills then those who concentrate within one state or season. Concentration of time and effort continues downward to hunting on average 3 to 5 spots on a trip. Most do, or should, agree hunters are far better at picking wrong than right. Hunting more than one spot mitigates any wrong spots. Such flexibility keeps MAHA hunters returning for many years of hunts. Subsequent seasons of experience which combine into a more detailed understanding on the same collection of land and season usually gives greater eyes on success. And, we realize for many deer hunting state of choice is frequently dictated by work schedules. Part of the flexibility that Mid-America Hunting Association brings the self guided deer hunter. We have a season in one of our three states that will work for most. Cannot say this enough. We have repeatedly observed over many years hunters who have the most success are ones who concentrate. Not just on one particular region, but also within one season. The muzzleloader hunter, archery or modern firearms deer hunter does best when he remains within one discipline. He learns nuances, seasonal habitat preference and methods. Contrasting is one who tries to hunt all MAHA offers. Crossing state lines, multiple methods and changing properties frequently. The difference between these two deer hunters is simple. One hunts whitetail deer. The other pushes bucks. There are other advantages to our muzzleloader deer hunts. However, that one specific point about concentrated effort in both time and location appears to be a central key to deer hunting success. This is for those hunters with the most recurring success. MAHA hunters can return to land previously hunted as well as add new land to his inventory of hunt spots each season.